The only Native American writer I know gave permission for a literary journal to republish thoughts about Thanksgiving that she had first corralled a few years ago, and reading them was an illuminating experience. Terra Trevor reminded me why American Indians are not necessarily as sanguine about Thanksgiving celebrations as I am. She also got me hoping that a few words of my own might ease the burden sometimes imposed by our cultural touchstones. For people in the circles through which Terra moves with easy grace, it is not the giving of thanks that rankles, but the lingering myth of pilgrims in the New World having celebrated the First Thanksgiving with Wampanoag Indians near Plymouth Rock in the autumn of 1621. Although that multi-day festival is almost always taught as a shining example of cross-cultural cooperation, its common position at the head of any chronology of thankful actions also implies that Chief Massasoit and his people learned gratitude from a motley band of separatists who fled Europe over differences with the Church of England. Framed that way, with a metaphorical trophy up for grabs, any attention paid to Puritan “first comers” seems arrogant, because people have been giving thanks as far back as ancestral memory goes, and not just for good harvests. Remember the story of Jesus healing ten lepers, only one of whom returns to thank him, at which point Jesus asks “Were not all ten made whole?” It was a rebuke to those who fail to acknowledge blessings, and it dates back about 2,000 years. We should not then be surprised if activists today take little comfort in knowing that the Wampanoag were part of the most famous thanksgiving in America, because those same activists have been striving to correct the misimpression that American Indians learned gratitude from strangers wearing buckled shoes. Observing that our civic calendar braids Native American Heritage Month with Thanksgiving, my friend wrote ruefully about children who “remember the Indians” by making construction paper headdresses in colors utterly alien to real eagle feathers or the regalia for which those feathers are sometimes used. It was an anecdote drawn from personal experience, when her then seven-year-old son recognized the absurdity of pink and purple in the headdresses that his friends were making. At that age, Terra wrote, it was not his job to carry the weight of something simultaneously funny and sad, and so she shouldered the burden for him. Thoughts written years later suggest that she still carries that weight. Easing her burden requires a lever and emotional distance enough to stand near the load rather than under it. With respect to the evocative memory around which Terra built an essay, for example, you do not have to be Native American to recognize the unlikelihood of finding eagle feathers in DayGlo colors. On the other hand, it requires rare seriousness to pursue realism in art projects for young children. Pink and purple headdresses made by second graders are not true to life, but neither are they conscious attempts to trivialize ceremonial regalia. The harvest celebration of 1621 gets good press because the Puritans were greatly relieved at surviving their first year in the Americas with Wampanoag help, but the lingering impact of that event owes little to subsequent conflicts between colonists and Indian tribes. Collective memory simply acknowledges that when history whistles a tune, oral tradition dances with the written record — and who better to acknowledge that reality than citizens of a nation with founding documents? While the Wampanoag had been celebrating before they ever met Europeans, it was the pilgrims who kept written records of their activities. 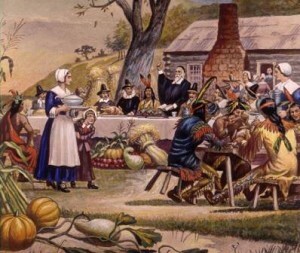 It might also help to remind ourselves that modern celebrations of Thanksgiving draw as much from official Thanksgiving proclamations by Presidents George Washington (1789) and Abraham Lincoln (1863) as they do from hand-shaped turkeys and other juvenile renderings of pilgrim life in the New World. Importantly, President Lincoln counseled gratitude even while steering the nation through a devastating war. The Judeo-Christian foundations of his moral reasoning — like Washington’s before him — were accepted by large majorities of Americans in all walks of life, whether slave or free. Composer Roger Miller understood that. Years after “King of the Road” put him on the musical map, Miller brought The Adventures of Huckleberry Finn to Broadway in the musical Big River, with critics everywhere marveling at his fidelity to the novel by Mark Twain and his apparent grasp of our national soul. One of the most memorable songs in a show full of them was a hymn of thanksgiving sung by slaves. For me that song ranks as the most effective of several possible rebuttals to anyone convinced that our national day of thanks should instead be a day of mourning and repentance. and love for me and you! is part of Him I feel. are bound to him as now. Anyone who has ever heard that anthem knows that it speaks of and to a truth that validates thanksgiving everywhere. The lyrics wrap a mysterious kernel of forgiveness and forbearance in a blanket of gratitude that knows nothing of Pilgrims or Indians, but can heal misunderstandings between their descendents if we take it to heart, and not just at the time of year when leaves crunch underfoot, geese scissor overhead, and cooler temperatures leech some of the blue from the daytime sky.